Find the 17 digit Vin number located on the steering stem. 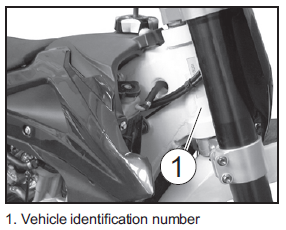 Your Serial Number/VIN (Vehicle Identification Number) is located on the steering stem. Also, on page 2 of almost every Parts Fiche you can find serial number information for each model. Find the Frame Number located on the steering stem & Engine Number located on the left or right side of engine case. Use the following Example and Identification Chart to identify your frame/engine. "ML" is the frame ID and the following number is the assembly line #. 00001 is the very first bike produced and there was 5,999 of these bikes made during 1975-76.